You don't have to toss your old cameras into the trash. One man's trash can easily become another man's treasure, and there are plenty of ways to recycle your camera--whether by turning it into an art project or donating it to charity. Even if your camera is in non-working condition, you can still find resourceful ways to transform an old camera into something new. Creating a display of old cameras on a shelf or bookcase in your home showcases your hobby and becomes an interesting conversation piece when guests come over. According to design blogs like Unplggd and Apartment Therapy, pieces of old technology, like vintage cameras, typewriters and old telephones can become sculptural works of art. Additionally, photographs of your old cameras can actually become works of art. Hang a series of three or more photographs in a group in similar frames. You can even sell your photographs on Etsy.com, a marketplace for handmade goods. If your camera is in working condition, you can recycle it by donating it to a charity. Check with your camera producer to see if they offer recycling options. For $6, Canon, for example, lets you print a pre-paid UPS shipping label off their website. Send it back, and they'll recycle your camera for you. You can recycle Sony cameras for free if you drop them off at a Waste Management eCycling drop-off center. Or you can mail your cameras to RecyclingforCharities.com, an organization that donates your old electronics to a charity of your choice. Photography with vintage cameras has become a trend, especially in the wedding industry. Brides are paying high prices for old photographs, like the old Hasselblad. Tintypes and Polaroid shot by New York City photographers like Weddings by Two. Even if you're shooting for your own personal collection, the grainy, shadow-and-light-filled images created by older film cameras can create a photograph much more interesting than the standard digital camera photograph. 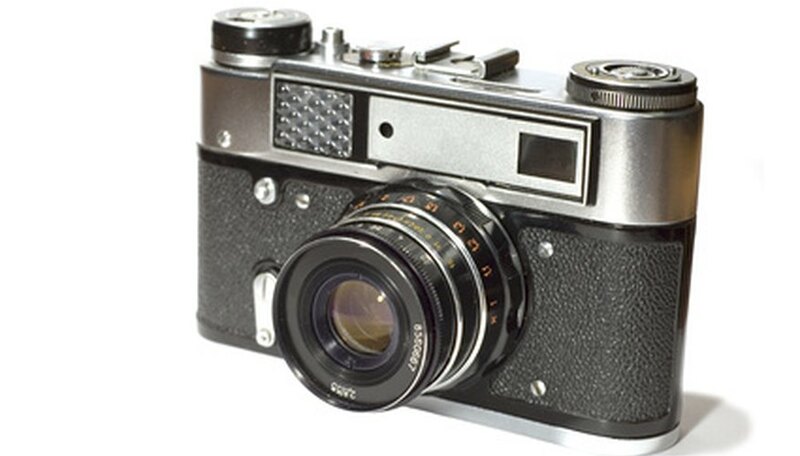 You can sometime sell your old cameras, working or non-working, to antique stores in your area. Alternatively, the website Used Camera Buyer will give you an instant quote for your old camera, pay for you to pack and ship it to them, and mail you a check. Ebay is an option for selling a camera to the highest bidder. And if you have an especially antique model, the Historic Camera Collector Club will also buy cameras. Victoria Kelly has been writing since 2006. She has taught writing at several universities and her stories have appeared in "Fiction" and "Colorado Review." She earned her Master of Philosophy in creative writing from Trinity College Dublin. She holds a Bachelor of Arts in English from Harvard University and her Master of Fine Arts in fiction from the Iowa Writers' Workshop.